1. Comparison shop, but don't let price be your only guide. 2. Consider second labels. 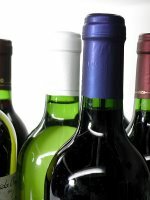 Great wines can cost a fortune; less-great wines from the same house can offer plenty of taste for a lot less. 3. Knowledge is power, but did you realize it could be tasty, too? Take advantage of wine tastings conducted by wine shops. 4. Check if your wine shop offers a customer discount card. 5. If you really, really like a wine, consider buying a case or two. 6. Don't pour that half-empty bottle down the drain. Recork it and stow it in the refrigerator. The wine should be fine the next day. 7. Shop the bargain shelves and discount bins very carefully. 8. So-called big box or warehouse stores boast that their hefty buying power allows them to get goods at deeply discounted prices. And so they do, even with wines. 10. Buy stuff you like.